I love the fall. It's a great time here with fast moving storms and color. 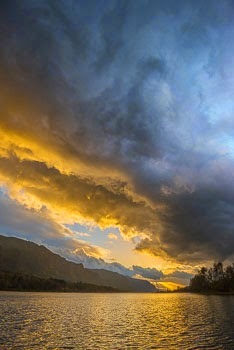 Whenever things look promising and I can get away, I'll head to my closest playground, the Columbia Gorge. It's also amazing how fast things can change in an hour near sunset. 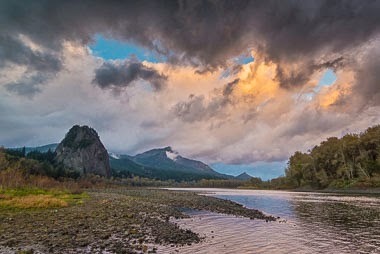 When I first arrived and walked to the Columbia River near Beacon Rock State Park, elk tracks were along the shore, and a family of eagles was hovering over Pierce Island just to the east. Moments later, to the west, the sun emerged again to display some amazing colors in the clouds. A strong, low, blue-gray cloud formed overhead, twisting and turning in the wind just above me. 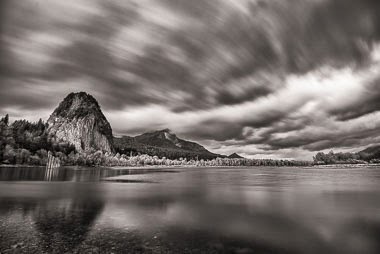 After the display was fading, the color to the NE near Beacon Rock was developing, so I ran with my gear and tripod over slippery, moss covered stones to a better vantage point with Beacon Rock and Hamilton Mountain. The warm colors receded and darkness approached quickly. A dead Turkey Vulture was in my path along the shore. It seemed fitting to see another cycle in nature. 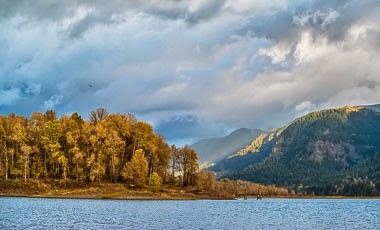 Clouds were still on the move, so I headed nearer to Beacon Rock. Silver Salmon were jumping as I set up the tripod and took some longer exposures of the dynamic motion as darkness approached.